Tchaikovsky was introduced to Belgian mezzo-soprano Désirée Artôt in 1868 during her Moscow tour. They were briefly engaged to be married; however, in 1869 she married the Spanish baritone Mariano Padilla y Ramos. Twenty years later, during Tchaikovsky's Berlin concert tour, they met again and she asked him to write a Romance for her. 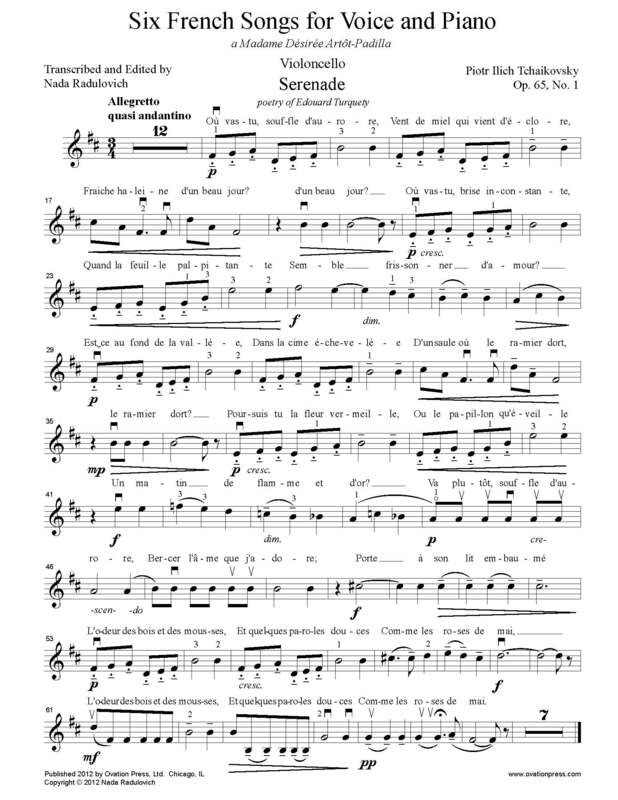 This request resulted in the work Six French Songs, dedicated to Désirée Artôt-Padilla, which was originally published in Russian translation as "Opus 65." This is the first edition of this work transcribed for cello with a complete English translation of the songs. The first song is the poem Aurora by Édouard Turquety (1807-1867). Here the mood is cast: saturated with images of nature, a romantic pursuit of an ideal and evasive love is established. Songs two, three, four and six are set to the poetry of Paul Collin (1843-1915). The second is his poem Deception, introducing the theme of disillusionment as the lone poet revisits the woods where he had once been happy. This is followed by Serenade, in which the poet joyfully finds reflections of his beloved in all of nature's beauty. Song four, Let the winter…, proclaims the lover's knowledge and faith of where to find the warmth of love despite the harshness of the season. Receding into a dark mood the fifth song Tears, a setting of the poem by Madame A.M. Blanchecotte (1830-1897), is a plea for the writer's emotional peace and a monument to the grief of a broken heart. The group concludes in celebration with song six Rondel, (published in Russian as Enchantress), as the poet observes and praises the beloved's overwhelming seductive power. Click below to watch a video of Nada Radulovich performing the third song, Serenade.